A soft blend of pianos, acoustic guitars, and drums will awaken a dream within. These instrumentals take you on a soothing journey for the imagination. Like a mix between Yanni, and Patrick O'Hearn. 'It's a Good Day' is a relaxing blend of instrumentals set to the sound of uplifting beats, and tunes. These 12 compositions use a soft blend of pianos, trumpets, orchestral strings, acoustic guitars, and drums. This album is a great way to relax after a busy day. 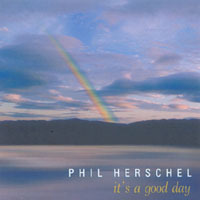 Phil Herschel has been entertaining for over 15 years, on the electronic keyboard, with a style of play often compared to Yanni, and Patrick O'Hearn. Instrumental music at its best! It's a Good Day is a wonderful collection of great songs. Among my favorites are Dream Within, The Forgotten, and Inner City. The Forgotten has a wonderful, upbeat section reminiscent of Industrial techno beats. Inner City has a moving tune with great instrumentals. The piano, trumpets, and strings are cleverly mixed throughout. This is definitely an album you will listen to again and again. Each track flows peacefully into the next. Most of these tracks begin with a soft tune, and build up to an impressive ensemble of strings, trumpets, and piano. This CD has a soothing, laid-back style of play, yet with a fine mix of upbeat tracks. It's very neat. Music is a beautiful language of : 1.Communications 2.Love 3.Kindness 4.Friendship 5.Joy 6.Appreciation. Phil has managed to incorporate all of these themes in the CD 'It's A Good Day'. Also, the explanation of each composition in the liner notes makes each piece more meaningful. An exemplary work! A soothing collection of songs for relaxing, or for inspiration. This assortment includes such classic pieces as my personal favorite, "Inner City". This composition is comprised of both a surreal climate of imagination and wonder, and a vivid world lying behind the real world. In short this cd is definitely a keeper. Do try it! Phil's Good Day made mine a Good Day. This is such a neat CD ... very motivating ... and very uplifting ... listed the first day when I was in a funk and Phil moved me out of it and helped me rise above it. The album opens with "It's a Good Day" filled with warm bell-tone synths, romantic strings, and a gentle sense of melodic serenity. "Morning Sun" is full of interesting synth strings, blending violins, violas, cellos and even basses in a sweeping fashion with true grandeur to it. "The Forgotten" begins a string of four tracks that are really excellent, especially given this genre (independent self-produced keyboard music). Various keyboard effects, melodic components, and rhythms are intermixed with self-assuredness and a sense of purpose. "The Traveler" opens with spot-on bell-tones but rather than take a celestial route, Herschel veers into melancholy via synth vibes and whooshing effects, gradually picking up the pace of the track and inflecting it with mild jazz undertones - nice! It's a Good Day is a solid album with a spectacular middle section. Personally, I'd gladly place this in my car CD player (if I had one, that is) as I hit the open road, and I have no doubt that the music would make the miles pass most pleasantly.